A few years ago, I read about stereotypical Indians in Richard Scarry's books, specifically, the ones in Best Word Book Ever. I started looking for them in his books but couldn't find any. The books I was looking through were newer editions from the local library. The images I was looking for, I realized, were in the older versions. The newer ones, in other words, have been revised. Stereotypical images of Indians? Gone! Hurray! This morning, a colleague (thanks, Rebecca!) sent me an email, pointing me to a flickr page that has side/by/side comparisons of images that changed from earlier to more recent editions. Do take a look at all of them, but study the ones of Indians, and read the comments. I is for Ice Cream - It's the page for the letter I, and it had a mouse wearing a headdress. In a comment just submitted, "French Connection" asks why I have "not recommended" in the label for this book. Thank you for pointing that out. To clarify what I mean, if you've got an older version of the book that has all those stereotypes, including the Indian ones, I encourage you to remove that book and replace it with one of the newer ones. 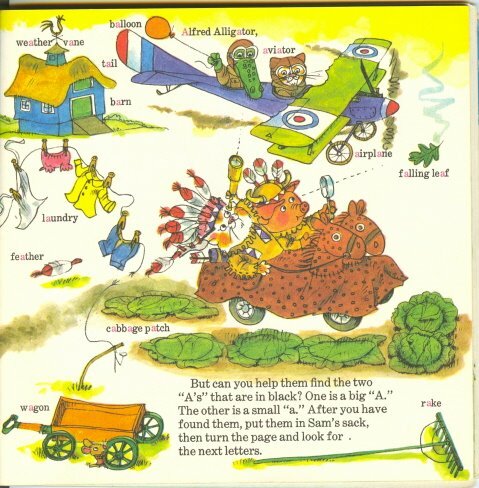 And, French Connection, you don't think your children developed "stilted" ideas about American Indians by reading this book... Can you ask them to draw an Indian, see what they draw, ask them why they did so, and report back to us? If they don't draw feathers on their Indians, can you ask them why they did not? I look forward to hearing from you! Thanks! Runs in my mind there's one about pirates -- only they're "pie rats" -- where a bunch of animals end up cast away on an "Indian island." But it is entirely possible, given the number of early reader-type books that go through here, that I'm mixing up two different Scarry books. I' had a copy of that book about the "Pie Rats" too, but I'm sure I've given it away. 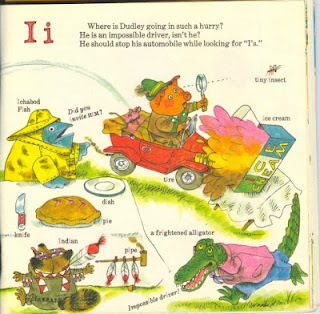 I had a bunch of the 'newer' Richard Scarry books for my children. But I have Richard Scarry books from when *I* was child. So, I do have a very old book that is a story collection - stories from "all over the world" - I'll see if I can find it. I don't remember anything in particular in there, but the last time I looked at that book I wouldn't have been looking at it the same way I look at things now. I have the word book - I'm not sure if we gave it away, and I'm pretty sure it is an old version because it was mine when I was a kid. I'll let you know if I can find it. So, even though the publishers have removed headdresses from newer printings, Scarry is still "not recommended" (per your tag)? What does a publisher have to do to receive your blessing? 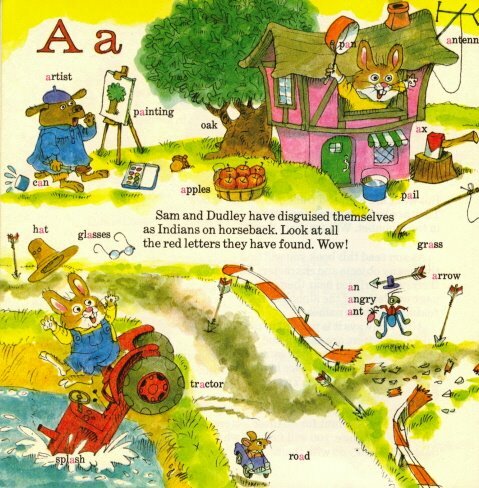 I don't think that the hours (and hours) that my children spent poring over Scarry's books have in any way given them a stilted look at American Indians (or helicopters, policemen, apple trees, or any other item or occupation illustrated in his books). I responded to your comment in an update to the blog post itself. Please take a look at what I said. And, I clicked on over and looked at your blog. I see you have a link to Stephanie Meyer's website, which I take to mean that you are a fan of her books. What do you think of the Native content in them? My children are 18 and 22 now and are more focused on Harry Potter and welding. I have raised them to avoid stereotyping any race or group of people. As far as drawing, the artist gene skipped my family altogether. Any attempt to sketch an American Indian may end up looking like a koala. 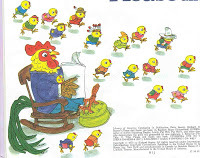 I am keeping my eyes open for a copy of Richard Scarry's Best Story Book Ever for my grandmother's shelf for the day (not too soon, I hope) when I can read it with my grandchildren. Ok, they're adults now. Can you ask them to tell you what they would have drawn as children? They don't actually have to draw for you. Just ask them "If I had asked you, when you were five years old, to draw an Indian, what would you have drawn?" Or you could ask them "If I asked you, when you were five years old, to tell me what Indians looked like, what would you have said?" I'm pressing this, FC, because we often don't really know how effective we are in teaching children about things like stereotyping. If your children reply that they would not have drawn a figure with a feather on its head, then, you were successful in your teaching, and I'd then ask you to tell us more about how you did that. Not generalities, but specifics. In Richard Scarry's Find Your ABC's, copyright 1973, the two main characters disguise themselves as Indians at the start of the story. There is also an Indian in "traditional" dress on the "I" page. My email is debreese at illinois dot edu. My daughter has a copy of the updated Best Word Book Ever, while I have an old copy of the original one on the top shelf. I wanted that book because of the gorgeous pages that are missing from the new one: the pages with the flowers, musical instruments, and multicolored dinosaur were very much missed. However, there are the pages that I don't miss, and those are the obvious ones. My least favorite has the word "squaw" on it. As a child, I just glossed over these pictures (something about them bothered me even then), but yes, had you asked me as a child to draw you a picture of an Indian, there would have been a feather somewhere. Hi! My name is Leah and I am a senior at the University of Wisconsin Oshkosh. I am taking a class called Representations of Indians in Children's Literature and your blog is on our reading list. I am finding the discovery that so many of the books I loved as a child had or have misrepresentations of Native Americans in them and I didn't even realize it quite unsettling. Richard Scarry was always one of my favorites, so I felt the need to voice a few questions on this one. Question: How could someone represent an "Indian" in a manner that is not stereotypical or offensive, but is at the same time recognizable as "Indian? Of course, as I typed that I began to think... Would someone put a picture of a "black" person on the "b" page of a book or a "white" person on the "w" page of a book or, to get away from color associations, a "Dutchman" on the "d" page of a book? The real question then, I suppose, is... Is Scarry's "Indian Mouse" offensive because it's a stereotype, or because he is using race as an identifiable image? Yet another question, would it be acceptable if the "Indian" had not been a generic "Indian" mouse and had instead been somehow identified as a specific tribe and put on a different letter page? Would a "Cherokee Mouse" on the "c" page have been alright and if so how does one go about illustrating a recognizable "Cherokee Mouse"? I hope nothing I've said comes off as offensive. I'm never quite certain of myself when I have these discussions and I am sincere when I tell you I am merely curious and have a very open mind. Thank you for your time and for the work you do! First, I apologize for the delayed reply to your questions. The first weeks of a new semester are very hectic and I'm behind on several things. Second, I am not offended at all with your questions. If more people in America asked these questions about representations of what they present or perceive to be "Indians" the problems of such representations would decrease. The point of alphabet books is to teach the names of the letters. This is usually done using objects. In older books, stereotypical images of "Indians" were on the I page and "Eskimos" were on the E page. There were not stereotypical images of other racial, ethnic, or nationalities used in the same way. Today, most new books do not have that sort of imagery on the I or E page. Older books persist, however, such as ALLIGATORS ALL AROUND. That's a favorite of enough people that it gets reprinted again and again because it sells well. Is what Scarry did "offensive"? It is definitely wrong, inaccurate, a mistake, educationally unsound. Using "offensive" hides the error in the image itself. His "Indian Mouse" is a stereotype. Because the book is used by young children, it adds to their growing knowledge of misinformation about actual people. If all people are going to be objectified, there's got to be a lot of explanation, or, children leave the book with a lot of incorrect information, and a lot of stereotyped information, and a lot of exotic ideas about a LOT of people around the world. Thanks for your questions, and extend my greetings to others in your class.